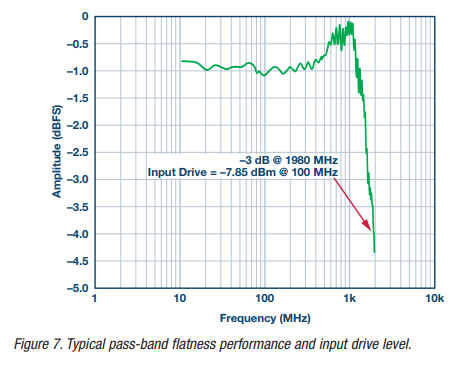 Rob Reeder, Analog Devices, Inc.
All the rage these days in the converter world is the GSPS ADC— otherwise known as an RF ADC. With such high sample rate converters available on the market this opens up the Nyquist by 10× as compared to five years ago. 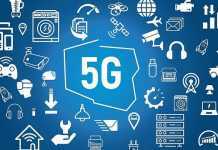 A lot has been discussed about the advantages of using RF ADCs and how to design with them and capture data at such high rates. Thank you JESD204x consortium. But one consideration seems to be forgotten about, the lowly dc signal. 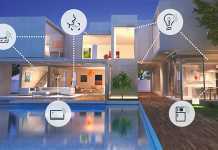 The design of the input configuration, or front end, ahead of a high performance, analog-to-digital converter (ADC) is always critical to achieving the desired system performance. 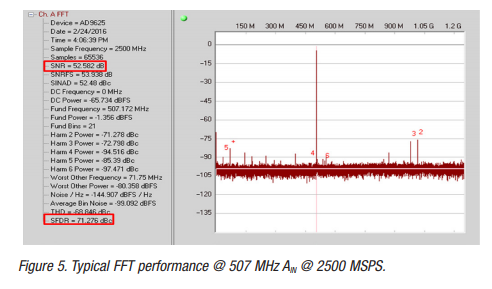 Typically the focus is capturing wideband frequencies, such as those greater than 1 GHz. However, in some applications, dc or near dc signals are also required and can be appreciated by the end user, as they too carry important information. 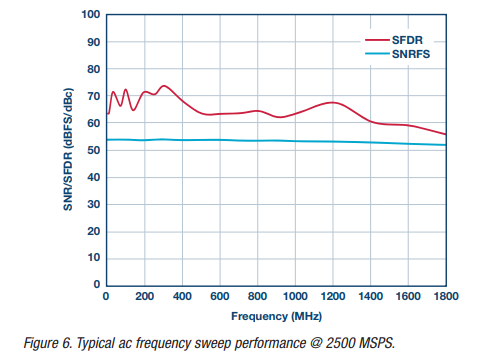 Therefore, optimizing the overall front-end design to capture both dc and wideband signals requires a dc-coupled front end that leads all the way down to the high speed converter. Because of the nature of the application, an active front-end design will need to be developed, as passive front ends and baluns used to couple the signals into the converter are inherently ac-coupled. 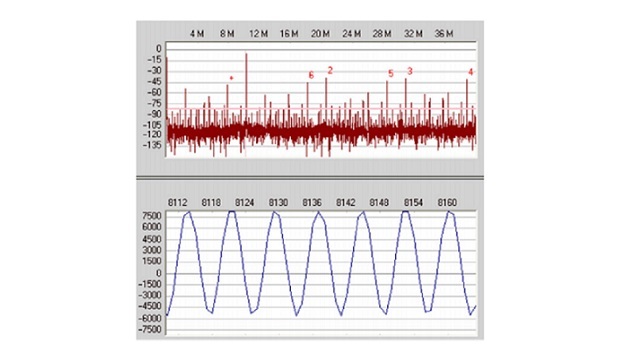 In this article an overview on the importance of common-mode signals and how to properly level shift the amplifier front end will be presented in a real system solution example. ADCs with integrated buffers typically have an internally biased commonmode (CM) level of half the supply plus a diode drop (AVDD/2 + 0.7 V). No external circuitry is required to bias this circuit, but it must be maintained to properly use the converter. For unbuffered (switched capacitor input) converters, the common-mode bias is typically half the analog supply, or AVDD/2. This can be supplied externally in a variety of ways. Some converters have a dedicated pin that allows the designer to provide bias through a couple of resistors tied to the analog inputs. Alternatively, the designer can connect the internal bias to a transformer’s center tap or can use a resistor divider off the analog supply (a resistor from each leg of the analog inputs to AVDD and ground). Check the manufacturer’s data sheet or applications support group before using the converter’s VREF pin, as many references are not equipped to supply a common-mode bias without an external buffer. It is tempting because the CM voltage you need is right there and handy, but be warned—don’t do it. 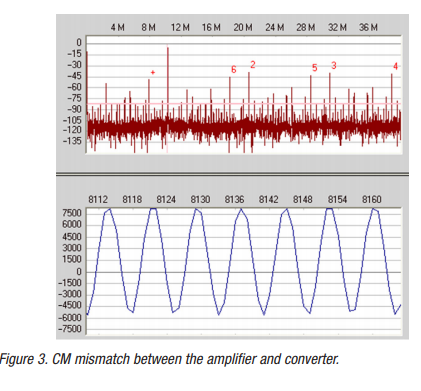 If the common-mode bias is not provided or maintained, the converter will have gain and offset errors that contribute to the overall measurement. The converter may clip early, or not at all, because the converter’s full scale cannot be reached. 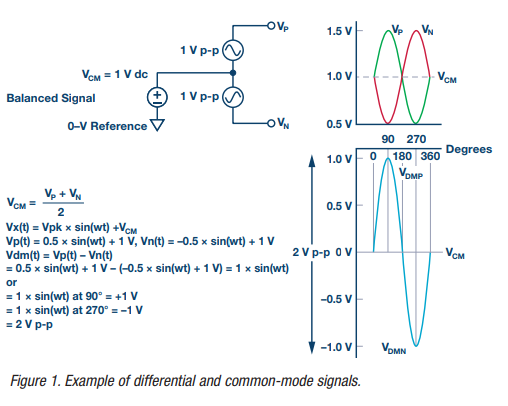 Common-mode bias is especially important when connecting an amplifier in front of the converter, especially if the application calls for dc coupling. 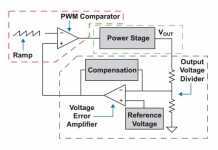 Check the amplifier’s data sheet specifications to make sure the amplifier can meet the converter’s swing and common-mode supply requirements. Converters have been pushing to smaller geometry processes and, therefore, lower supplies. With a 1.8 V supply, a 0.9 V common-mode voltage is required by the amplifier if dc coupling is required. Amplifiers with 3.3 V to 5 V supply voltages may not be able to maintain that low of a level, but newer low voltage amplifiers can, or the designer can use a split supply and use a negative rail on the VSS pins. However, when doing this, keep in mind other pins also may need to be connected to the negative rail. Consult the data sheet and/or the direct application support for the product to find out. 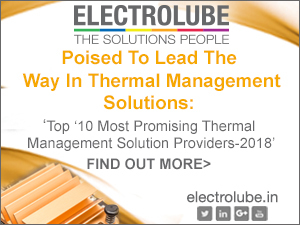 Let’s start with defining what a CM voltage is. Figure 1 shows how a converter sees differential and common-mode signals. A CM voltage is simply the center point around which the signals move—see Figure 1. You can also think of this as the new center point or zero code—an amplifier, CM is established on the outputs, usually through a VOCM pin or similar. Be careful though, these pins have certain current and voltage range requirements too. It might be best to review the amplifier data sheet and/or use a robust bias point that doesn’t load down any adjacent circuitry or reference point within your circuit. Don’t simply tap off a converter’s voltage reference pin (VREF), which is usually half the converter’s full scale. It may not be able to provide enough bias with good accuracy. It would be prudent to review the pin specifications on the converter’s data sheet as well. Usually something like a simple voltage divider with 1% resistor tolerances and/or a buffer driver will work to set this CM bias = properly for an amplifier. DC-Coupled Set VOCM within limits specified on DS. 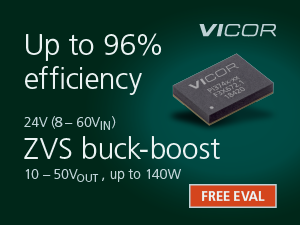 Use voltage divider or buffer amp from ADC VREF/CML pin. Does not provide CM bias. 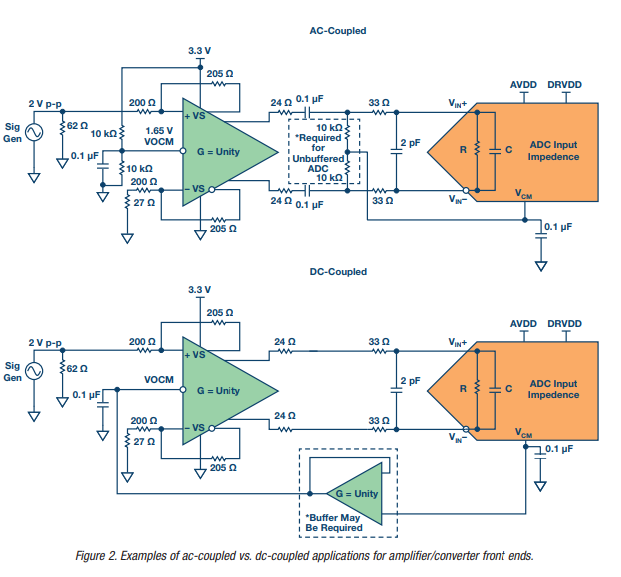 Make sure both the amplifier and ADC CM bias are within range of each other. Otherwise, a mismatch will cause errors. DS. Use voltage divider or some other stable bias point. Sets VIN CM bias to AVDD/2. Use voltage divider or CML pin to provide CM bias. Place ac coupling caps on output of amplifier. DS. Use voltage divider or some other stable bias point. Does not provide CM bias. VIN pins are self biased to AVDD/2 + 0.7. Place ac coupling caps on output of amplifier. 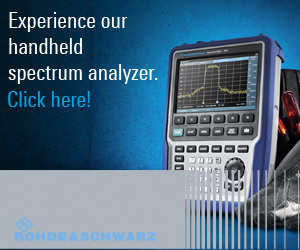 If the common-mode bias is not provided or maintained, then the converter will have gain and offset errors that degrade to the overall measurement being acquired. Simply put—the converter output will look like Figure 3 or some variation of it. The output spectrum will take on the form of looking like an overloaded full-scale input. This means the zero point of the converter is off center and not optimum. The designer may find that the converter will clip early or not reach the full scale of the converter. Recently this problem has gotten worse since converters are using 1.8 V supplies and lower. This means the CM bias for the analog input is 0.9 V or AVDD/2. Not all single-supply amplifiers can support such a low commonmode voltage while maintaining relatively good performance. However, some new amplifiers have accommodated this and are out on the market today. Therefore, it would be prudent to review which amplifiers can be used in your new design. Not just any old amplifier will work because the headroom may become very constrained and the internal transistors start to cave in. If a dual supply is used with an amplifier, there should be sufficient headroom in most cases in order to achieve the proper CM bias. The downside is an extra supply—a negative supply that maybe nonstandard, which means more parts and more money. Simple inverter circuits will work to help with this. In this configuration shown, the front-end interface is optimized for wideband sampling while preserving the dc signal content. Since the part is +5.5 V tolerant. The design used a split +3.3 V and −2 V AVDD supplies. This made the common-mode alignment simple between the output of the amplifier and inputs of the ADC, both of which needs to be +0.525 V on both AIN+ and AIN−. Also, notice that a couple of the amplifier pin functions that were ground-enabled (Vss) with just a single power supply are now forced to the −2 V supply (new Vss). Finally, the interface needs to be optimized for front-end BW between the amplifier and ADC. This is typically done in an iterative fashion as well. However, there are several notes to keep in mind on what sets certain values between the two ICs. The following list of rules can be applied in order to get the best BW out of the interface. Then, select the amplifier external series resistor (RA). 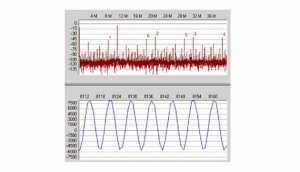 Make RA <10 Ω if the amplifier differential output impedance is 100 Ω to 200 Ω. Make RA between 5 Ω and 36 Ω if the output impedance of the amplifier is 12 Ω or less. In this case, a 10 Ω series resistance was chosen with a differential output impedance of 10 Ω for the ADL5567. Otherwise, dual supplies or level shifting circuits will need to be involved in the system design, as described above in the dc-coupled design. Rob Reeder is a system application engineer with Analog Devices in the Aerospace and Defense Group in Greensboro, N.C., focusing on military and aerospace applications. He has published numerous articles on converter interfaces, converter testing, and analog signal chain design for a variety of applications. Formerly, Rob was an applications engineer for the high speed converter product line for eight years. His prior experience also includes test development and analog design engineer for the Multichip Products Group at ADI, designing analog signal chain modules for space, military, and high reliability applications for five years. Article Courtesy: Analog Devices Inc.